St Cadmarch's has now been listed as a grade 2* building by CADW. 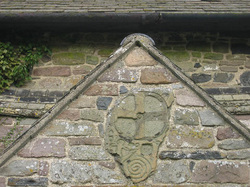 Early evidence of Christian worship in Llangammarch is provided by an ancient stone now fixed to the wall above the entrance to the present church. This depicts an infant, with arms extended, a coiled serpent overlaid with a celtic cross. It has been suggested that the carving is pre-Christian, possibly a burial stone, with the cross being added when the native Celts adopted Christianity. This site was certainly used for burials before the Chrisitan era. The coming of Christianity would have seen simple buildings erected for worship in this sacred space. Little is known of these until the 19th century. The present church was built close to previous church buildings. Around 1800 the local historian Theophilus Jones wrote that the parish church of Llangammarch had only the nave remaining and by 1840 the church was described as being in avery ruinous state'. 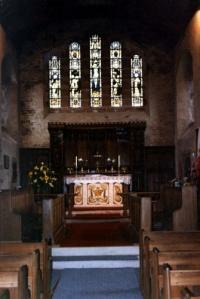 It seems that in about 1890 the church saw some restoration work at a cost of around £200. In 1910 it was said that 'the present church of St Cadmarch is a building of stone in the modern Gothic style, having a chancel, nave, north aisle, south porch and a belfry with one bell.' It does not, however, seem to have been a very remarkable building, and was demolished in 1915 to make way for the present building. The architect of the new church, built to reflect the growing importance of Llangammarch as a spa region, was William Douglas Caroe. Caroe was a major architect of the late 19th and early 20th centuries, who is known in Wales as the architect responsible for the design of Cardiff University and for the restoration of Brecon Cathedral. He was an advocate of the 'Arts and Crafts' movement in architecture, which valued the traditional skills of the artist or craftsman at a time when machinery was taking their place in a drive for speed and cheapness of production. This is seen in St Cadmarch's is the fine craftsmanship of the timber doors, internal stonework, elaborate oak reredos and lectern. north aisle was never completed and the brickwork intended to take the new aisle can still be seen there.The tower has now been repaired with help from the Lottery Fund and it is hoped to further improve this in the near future by adding a disabled toilet unit..
Continue down the hill and the church is situated on the right hand side of the road just before the T-junction and the railway bridge. The church is also directly above the Railway Station on the Heart of Wales railway line.